My friend and fellow blogger Denine Gorniak aka The Bicycle Chef was among the select guests invited to participate in the amazingly chic food event called Diner en Blanc! What is Diner en Blanc? - There are about a dozen or so now. Most take place in Europe and total several hundred members each year. 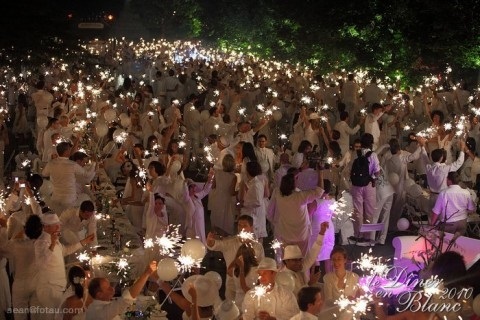 The most important Dîner en Blanc, which was also the starting point of the movement, is the one in Paris. Instigated over 25 years ago with a handful of friends. At the last minute, the location is given to friends and acquaintances who have been patiently waiting to learn the “Dîner en Blanc's” secret place. Thousand of people, dressed all in white, and conducting themselves with the greatest decorum, elegance, and etiquette, all meet for a mass “chic picnic” in a public space. 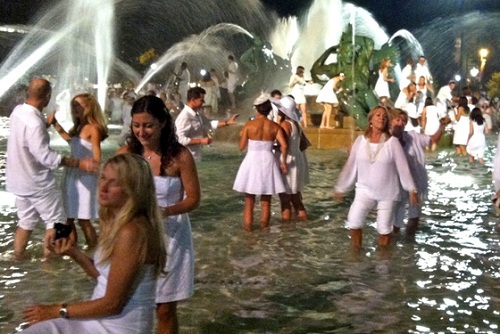 T&T - Denine, how did you get on the list of attendees for Diner en Blanc Philadelphia? DG - I saw that the Philly coordinator was Natanya DiBona - a very unusual name, and that I knew/know this woman from when I worked at Williams Sonoma. She was my assistant when I was the cooking class chef/instructor. She moved to New York 6 years ago and I didn't even know she was back in Philly. DG cont - Quick and as sly as a fox, I facebook friended her so I could be assured to be remembered to be put onto any guest lists! T&T - I know the event does not provide the food, the guests bring their own, so is their a cost involved with participating? DG - There was a $25 per person fee to register for the event. The fee goes to cover the costs to the organization... bus rental, electricity, sound system, lighting etc.. I'm now an official Diner en Blanc member, the membership cost was only $5. T&T - As distinct and magical as this evening looks to be, it's not an easy event to attend because you have to really organize yourself like a camping trip and bring everything, right? DG- Yes, you had to bring EVERYTHING! We bought a folding roll-up camping table from LLBean, 2 new chairs from BizChairs.com; I figured that a) we would use them again and b) I didn't want to traipse all over and beg borrow and steal these items only to not find them. We bought new white outfits, which was easy and fun and we love to shop. Got good deals at Macy's as white clothes were nearly out of season and seriously discounted! We borrowed a white tablecloth from work. Bought napkins, which will be put to good use again. Bought fancy plastic melamine plates and bowls, which again, we'll use a lot. DG cont - For the tablescape, we did a dry run at home picking and choosing from the many party items we have at home in my "catering and party planning" pantry. We wanted the table to look nice but not be too crowded. We knew that the event would be too stressful for us to stress on trying to make the most lavish table and we wanted to have fun, so we kept it simple. Which paid off as we had a lovely table and many people complimented us all night. I had a tiered table scape with bowls on levels and battery operated lights along with a candle and faux flowers in an Ikea metal basket. T&T - The most important question - What did you eat? DG - We went with our favorite easy meal, great for having at home, for parties and for picnics. Good bread, a variety of cheeses, nuts, dried and fresh fruits. We had roasted chicken, and two cold salads. There were petit fours and a small apple pie. For our beverages we had a nice bottle of Italian Processco that someone gave to us as a house warming gift back in December, along with a sparkling water. We had more than enough food to share! T&T Now that you're a member of Diner en Blanc, I assume you'll be looking forward to doing it again next year. What if anything would you do differently? DG -Well for next year, less food, maybe a bit fancier tablescape and I'd figure out how to cart less stuff or pack it better for the long trek on public transportation. As for fun, it couldn't have been a better time! We did stress about stuff beforehand, but once we were there and in the moment, we just enjoyed the ambiance, the location, all the many lovely people and the experience that we were in Philadelphia, doing and partaking in this extraordinary event - a once in a lifetime magical event. 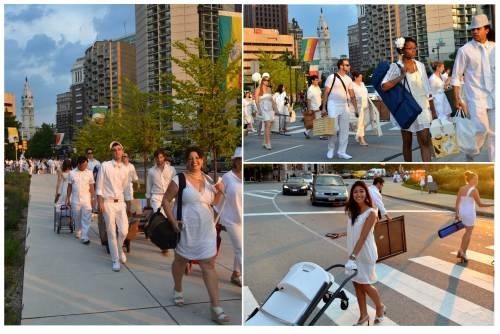 On Thursday, August 23, 2012, 1300 people, all dressed in white, met at various locations throughout Center City Philadelphia, between 6 pm and 6:30 for the first ever (Philadelphia), Diner en Blanc. We came armed with our own tables, chairs, picnic baskets full of sumptuous foods, wine/champagne, dishes, silverware, candles, and all the makings for a spectacular evening dining al fresco. Diner, drinking champagne, conversing with friends and strangers who became new friends. Sparklers were lit at 8:45, then the dancing commenced, with party goers making their way around the Square to check out everyones' tables and set ups. Photos, compliments, laughter were shared freely all night long. Then people began wading and dancing in the famous Swan Fountain, making the evening have a gentle debauched feel, like a scene from a 1940's Gene Kelly movie, innocent and merry. The party was to end at 11 pm, diners taking their belongings and leaving Logan Square as we found it. We left by 10:30, like two Cinderellas leaving the ball before midnight; before our white ensembles turned back into our everyday clothes and the beauty and magic of the evening ended. It was a fairy tale evening, not quite perfect, but marvelous and magical in every way.